“This is the best thing I have ever tasted in all my life.” That’s high praise. High praise coming from my daughter who without a doubt is the foodie of our family and, don’t kid yourself, she knows exactly what she is talking about. I should mention that she is 9 years old, and when she breathlessly uttered those words, we were seated at a booth in the oh-so-posh Gordon Ramsay Steak, in Las Vegas. Notice how I said “posh” just like a Brit would; I’m clever that way. Now, where was I? 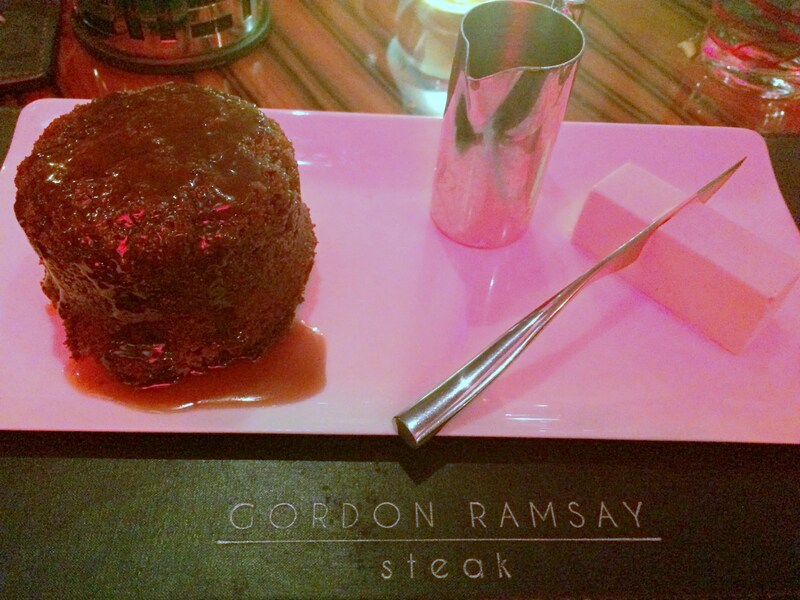 Oh yes, Gordon Ramsay Steak in Las Vegas. Now you might think that she was noshing on some chicken fingers from the children’s menu, but she wasn’t. In fact, there isn’t a children’s menu at Ramsay’s Restaurant. 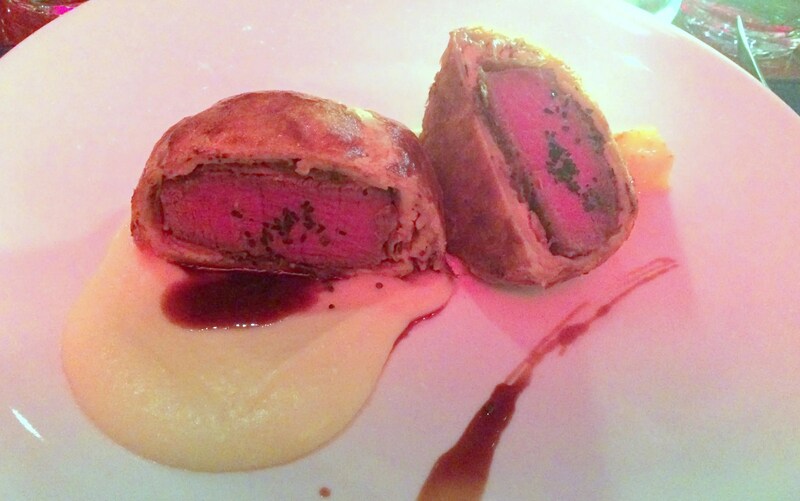 She was thoroughly enjoying one of Ramsay’s signature dishes: “Beef Wellington”. I must apologize for the photos. We took them on our iPhone, and in the dark restaurant it was difficult to get a good shot. While I know it’s hip to be a food blogger and all, I guess I am old school. I feel a little like the Clampetts at the “fancy eatin’ table” when I pull out my camera to take a photo. Besides, we wanted to dig into the spread before us and not spend too much time taking the perfect photo! It was a bit of a busy summer for us and with work and other commitments we ended up making a last-minute decision to take a week and head off to see the Grand Canyon. 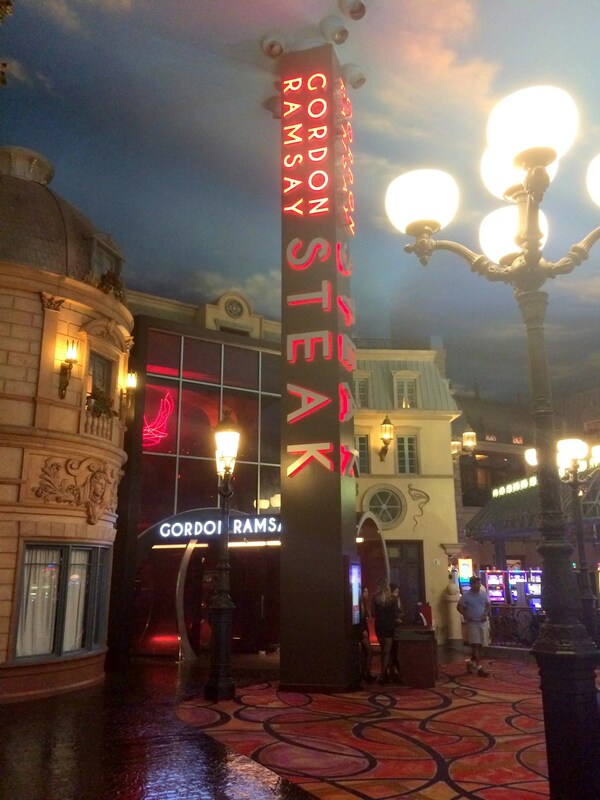 Somewhere along the line we decided to make a stop in Sodom and Gomorrah, er, I mean Las Vegas for the sole reason of having a once-in-a-lifetime dinner at Gordon Ramsay restaurant. Our expectations were high, and while it could have gone south faster than a risotto in Hell’s Kitchen, it was the best meal we have ever had as a family. The Restaurant is located in the Paris Casino. You can’t miss the sign near the back when you walk in the front doors just under the Eiffel Tower. I loved that the entrance to the restaurant is cylindrical in shape to depict the “chunnel” passing from France into England. At least, that’s what a hostess told us. Speaking of the hostesses, you might be able to see them in the picture just at the front of the “chunnel”. I am pretty sure they are the granddaughters of women in the Robert Palmer “Addicted To Love” video from the 80’s! They looked just like them! 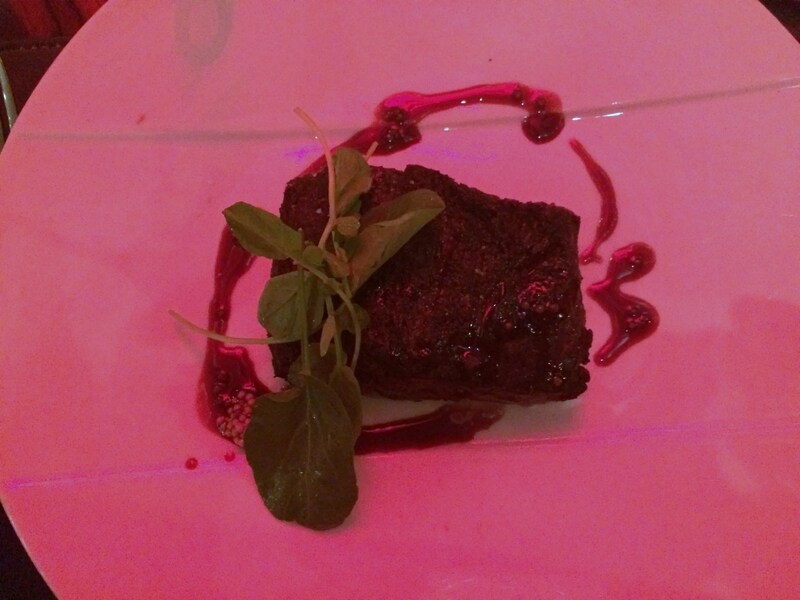 The restaurant was a dark, loud sort of cross between an upscale steakhouse and a nightclub. 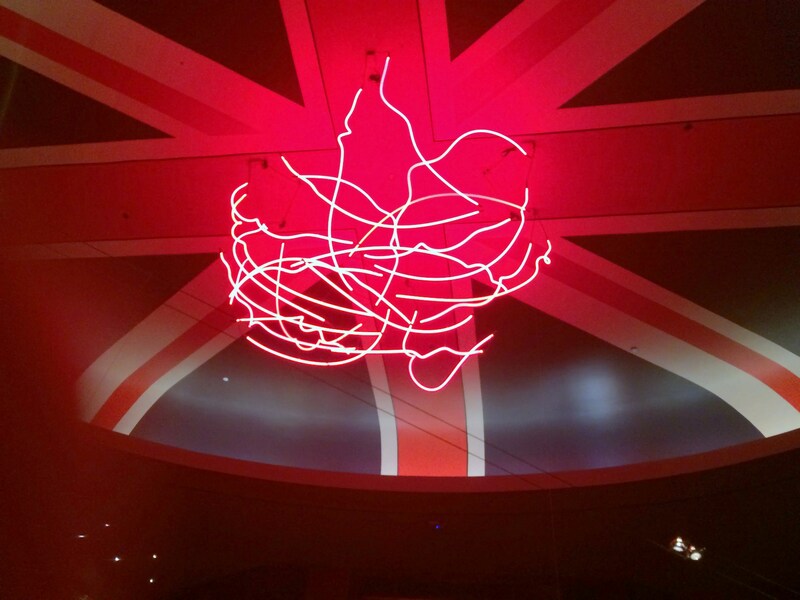 There is a cool neon “sculpture” on the ceiling which is an interpretation of Ramsay’s movements when he is making his famous Beef Wellington. Being avid watchers of Kitchen Nightmares, Hell’s Kitchen, and Master Chef, we nearly passed out with excitement when we were seated at a booth which was ring side to the open kitchen. We had a great view of all the line cooks as well as the expeditor and head chef doing quality control. I should probably note that the head chef didn’t once yell “It’s RAW!” or “You’ve killed it!”. 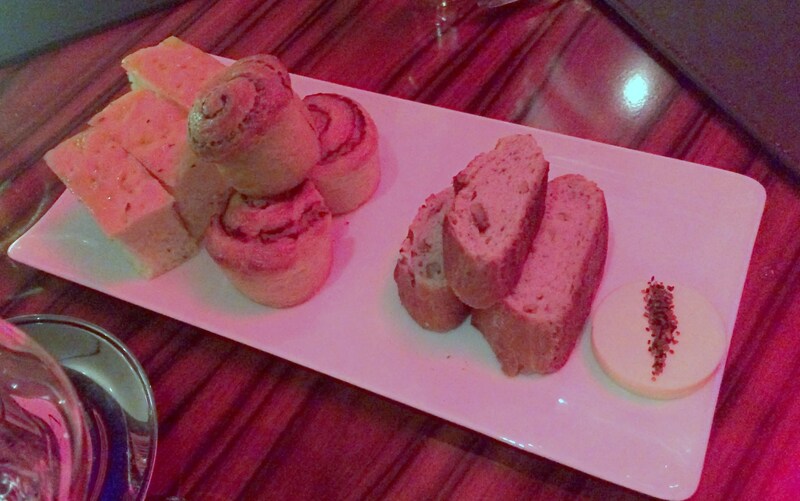 It was disappointing, but we got over it as soon as the delicious bread was brought to the table. I am serious. The bread was that good. I have to admit, our Waiter, Christopher, looked a little nervous when he saw our two kids. I think he might have been worried we were going to ask for pasta with no sauce, or cheese pizza, or some other kid friendly food. 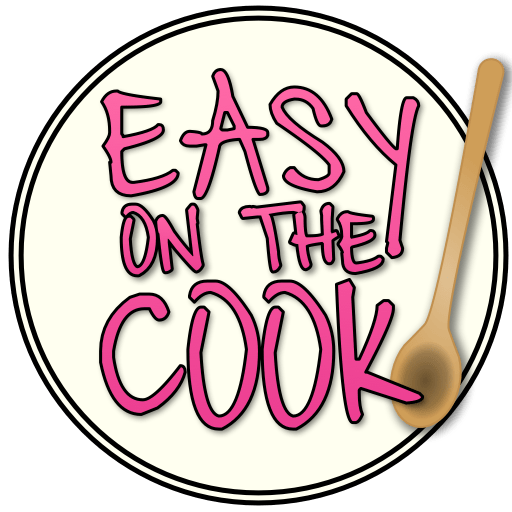 But we had done our research online, and we knew there was something for each member of the family, even my son who is a little less adventurous than his sister when it comes to the culinary world. I have to say, the entire staff was fabulous to our family and made the dinner even more enjoyable. I will say that you know you are in a fancy joint when the waiter has an assistant. 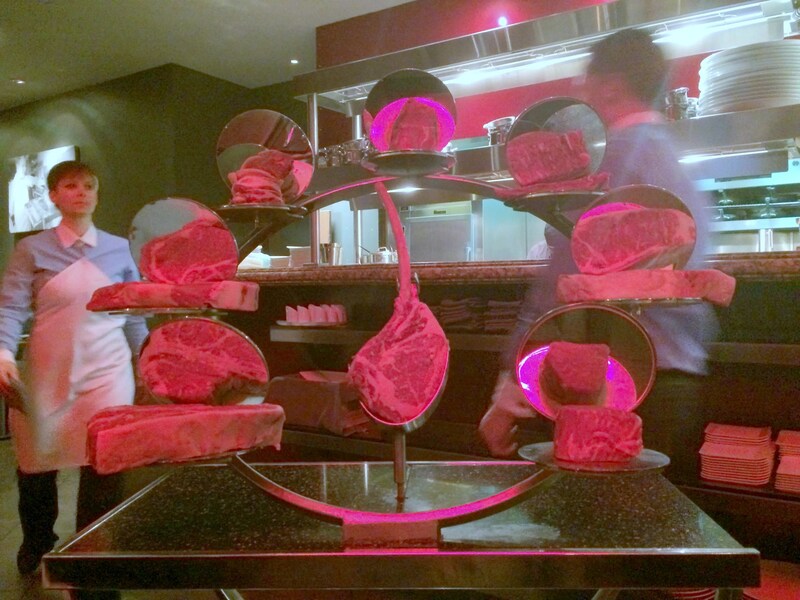 Check out the steak “Ferris wheel” (I call it that, they don’t). The waiter rolled it out to explain all the different cuts of meat they have. Truth be told, I kind of thought it was something that Chef Ramsay might make fun of in an episode of “Kitchen Nightmares” but it was impressive nonetheless. Let’s get down to the nitty gritty. We ordered two appetizers to share. Kurobuta Pork Belly: cheesy grits, tomato jam, onion pork jus. Melt in your mouth pig goodness. Can’t go too wrong with bacon and grits. We all loved it. We also had the Maine Lobster: Chorizo stuffed Maine lobster, pattypan squash, pickled cipollini onion, brandied lobster cream sauce. For me this was the best thing I have ever tasted in my life (to use my daughter’s phrase) – I still think about it. 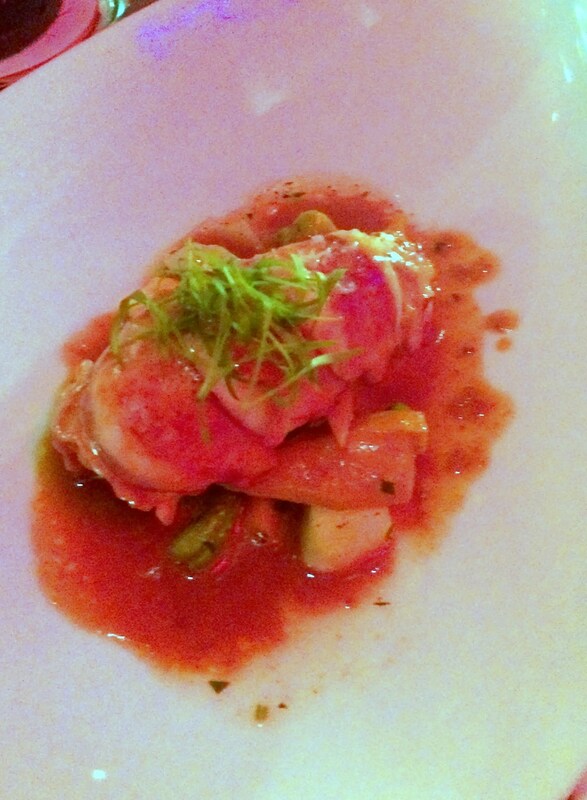 The lobster was so tender and the sauce was rich, flavorful and complex. I wanted to lick the plate clean. Don’t worry. I didn’t. But I still think I should have. I will have to chalk it up as one of those missed opportunities in life. What can I say, my husband knows how to pick em’. This picture does not do it justice but trust me, it was fabulous! My son ordered the Fish and Chips: Loup de mer, truffle chips, crème fraîche tartar sauce. His quote; “This is very, very good”. I can’t comment on the taste. He didn’t leave me even one bite. 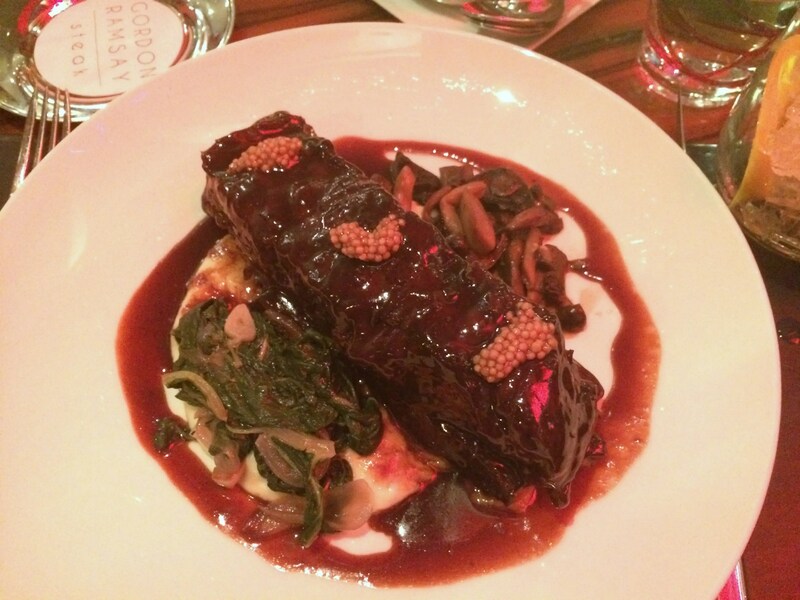 I had the Beef Short Rib: A red wine braised short rib, potato purée, wild mushrooms. It was very very good but the wrong thing to order on a 110 degree day in Vegas. It was a huge portion and very rich. I probably ate less than half and since we were staying in a hotel it just wasn’t practical to take leftovers with us. It was very sad to see the server carry it away when I was finished. Maybe one day Gordon will make it for me in front of a roaring fire on a snowy winter day! Hey, a girl can dream can’t she? We also shared some sides of Truffle Mac and cheese, Brussel Sprouts, Sauteed Mushrooms and the Peppercorn Sauce for the steak. The mac and cheese was to die for. Mushrooms were perfect and the peppercorn sauce was rich and flavorful and was an excellent finishing touch for the steak. I have to say the Brussel sprouts were only ok and were a little bland. Gordon if you ever read this, you still love me right? While the appetizers and main courses were fabulous. I have to say the desserts were simply stunning. Peanut butter bar was recommended by our waiter and was delicious and surprisingly light. My son had the Apple Tart Tatin. He said it was really good fancy apple pie. Again he didn’t give me a taste. I think he’s officially out of the will. My husband had the Chocolate pot de creme that he said was amazing. Again, no taste for me. Please folks, always remember to save Momma a taste! And sticky toffee pudding which my daughter raved about, saying “If I ever taste anything as good as good as this again in my life, I will be lucky.” That girl really knows how to enjoy her food! 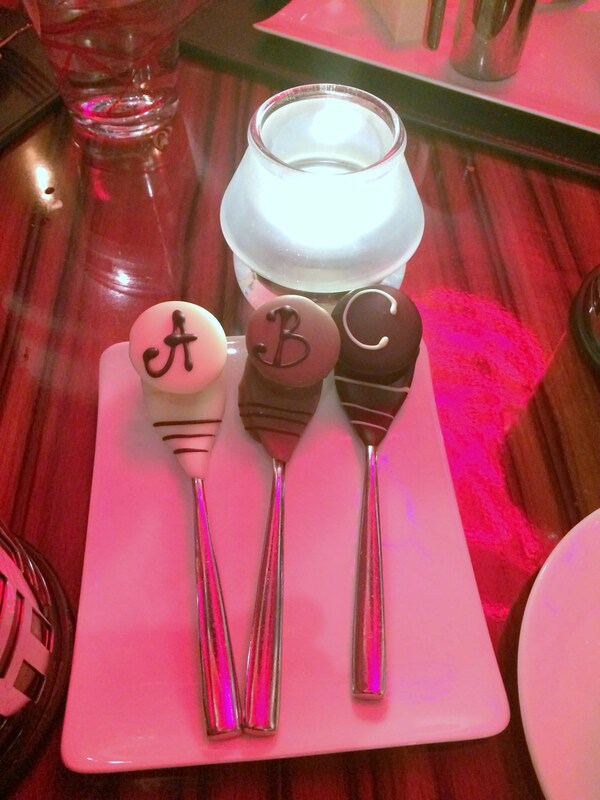 Another highlight was the chocolate spoons they served with coffee. Way to turn a cup of coffee into a rich chocolate mocha delight. Heavenly. They are also very proud of those chocolate spoons. The manager stopped by our table to tell us they are the only ones who have the chocolate spoons with the coffee service Well at least I think he was the manager, he was wearing a suit and had a name badge, but I didn’t have my glasses on. I couldn’t read it. He might have been just an enthusiastic customer for all I know! It was a spectacular experience and one our family won’t soon forget. 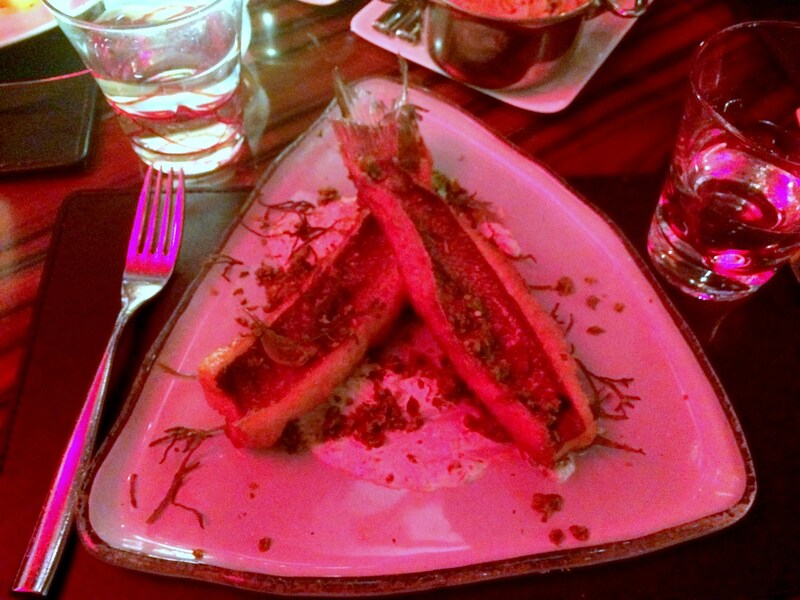 The food was amazing, the service impeccable. And it’s fun to eat at a restaurant where the staff appear out of thin air to remove a crumb that has landed on the table. I would highly recommend the ring side booths to watch the chefs and the food servers swarm like bees when the food is ready to be delivered to diners. While we obviously won’t be going out for four hundred and twenty-five dollar meals (gulp) on a regular basis, I sure hope I get a chance again in my life to enjoy that Maine Lobster Appetizer, and maybe then I’ll stop daydreaming about it. Thanks to Gordon Ramsay and staff for making some great family memories! My mouth is watering ! I really enjoyed your post, thanks for sharing ! It was a pretty fabulous dinner, really kind of a once in a life time thing. 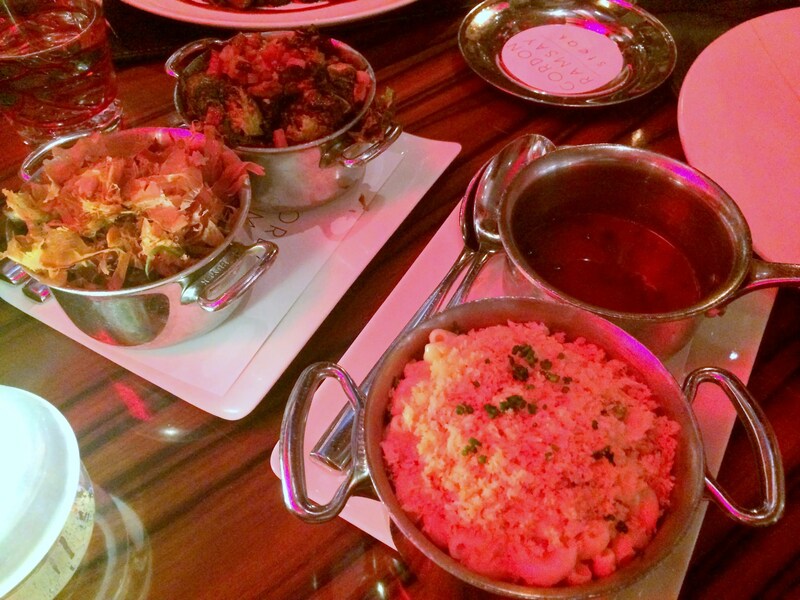 I was so relieved the food was spectacular but most of the reviews I read were good ones. Thanks for posting. That is a humongous gulp on the bill!! I wonder too if you could tell me how customers were dressed. Shannon there was everything from jeans to ties. There didn’t really seem to be a dress code or anything. We dressed up a bit only because it was a pretty big deal for us! I dream of doing something like this! I’d love to try one of Eric Ripert’s restaurants too. 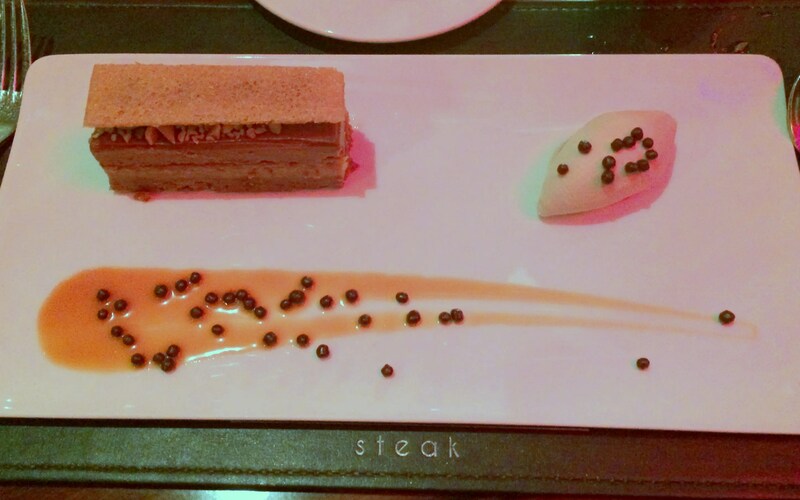 Thanks for sharing your experience – what a fabulous treat! It really was a dream! And a wonderful splurge for certain. My son is still comparing all the Mac and Cheese in the world to Gordon’s. He hasn’t found anything close so far!